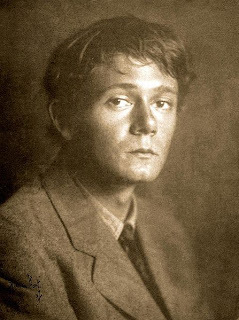 That is not from the M-Brane slush, but rather the opening paragraphs of a story called "The Plutonian Drug" by none other than Clark Ashton Smith (shown here in the pic at age eighteen or nineteen, rather attractive if melancholy-looking as a young man) published by Amazing in 1934. In its day, this may have evoked some "sense of wonder" and been really interesting to readers of the earliest sf, but it's well nigh unreadable now and such an opening passage certainly would get a story bounced at M-Brane. Indeed, a lot of stories do open like this and get bounced. And the passage above is actually a lot better than much of what I usually get in the slush, probably because Smith was a talented writer even when he was writing such tedious material as "The Plutonian Drug." But it doesn't let up after those first two paragraphs. It goes on for at least fifteen hundred words in this fashion. Eventually, the story itself starts, which is about Dr. Manners's guest sampling some of the drug from Pluto and having a trippy experience where he sees his own (very short) future. That part's actually pretty decent, but one must first slog through pages of these dudes blathering to each other about stuff that they both know already (selenine, "as you know," practically wiped out cancer). I see story after story after story where various kinds of scientists, doctors, and academics sit for the first few pages and discuss at length whatever the sciencey business of the story is. Instead, I'd rather open with an event happening to the characters that is perhaps based in whatever they are talking about, but bypassing altogether the long discussion of it. Also, characters in very narrow and elite professions, like "nuclear physicist" or "professor emeritus of biology," are especially hard to relate to or care about unless some kind of human action is happening to them right away. They need to be more than their job title.